Chicago: Performance-calibrated building design and student-centric spaces will give students control over their environment and generate performance data to be shared with university and architectural communities beyond the IIT campus. The quality of student life outside the classroom makes a difference in college education. A recent survey of first-year students at the Illinois Institute of Technology (IIT) in Chicago found that 9 out of 10 thought sharing bedrooms and bathrooms with fellow students was of great benefit to them, helping to support the transition to college life and ease the formation of new friendships. Juniors and seniors, in contrast, have a desire for greater independence and privacy, with more single bedrooms, fewer people sharing baths, and apartment-style suites that have their own living room. All enjoy generous social and study spaces shared by clusters of students to further encourage a sense of community. These findings came out of a year-long study that Chicago-based Dirk Denison Architects (DDA) undertook in developing the program for two new student residence halls designed as additions to the McCormick Student Village (MSV), IIT’s main undergraduate housing complex. The study gathered input from current and past MSV residents, undergraduate and graduate students, and campus staff. 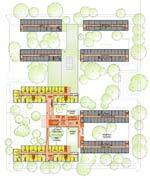 The design process also included extensive research analyzing 35 student residence halls built in the previous five years across the country, including factors such as construction costs, student amenities, square footage per student, and environmentally responsible design, culminating in a benchmarking document outlining best practices in student housing. 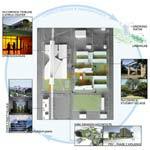 The resulting design not only provides students with a greater range of options for living and socializing, but also incorporates innovative sustainable design strategies. 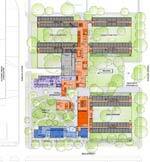 The existing McCormick Student Village has six wings, with a total of 850 beds. Bedrooms throughout these existing halls are configured as twin-bedded doubles, with shared bathrooms down the hall. The two new wings are designed to incorporate the privacy and independence desired by students to make on-campus housing attractive as they progress into their upper-division years. With a total of 420 beds in duplex, apartment-style living units, the new residence halls offer an increased variety of amenities and room configurations – most significantly, the inclusion of single rooms. The standard living unit, a duplex pod housing six to eight students, incorporates a combination of four single and double bedrooms connected to a common two-story living room, a kitchenette, a study loft, and two private bathrooms. The benchmarking study found that shared social and study spaces located in hallways, in the flow of traffic, were rarely used, while those defined by at least three walls were the most successful. Placing social spaces in an isolated location also discouraged use. In the new wings at MSV, shared study and social spaces will be well defined, located off primary circulation routes and in close proximity to each other. Juniors and seniors enjoy the overall benefits of being part of a unified housing complex on campus, yet they also desire social space defined for their specific needs. The social spaces for upper-division students, including a library, laundry room, and lounge, are grouped along a bridged connection between the new and existing wings on the second floor. Of the existing six wings, the four grouped at the north end of the village will be designated for freshmen and sophomores and will retain their current room configuration, with double-bedrooms paired with shared bathrooms down the hall. New social spaces will be configured within the space of the existing corridor-style lounges on the ground floor, giving first- and second-year students their own space for study and recreation, and connecting the four wings on the ground level. The two existing southern wings, which will be conjoined on the second floor by the social spaces to the new wings, have the opportunity to be reconfigured from doubles to singles to house upper-division students. A new grand entrance and stair hall provide a single point of entry for the entire complex, enhancing security and increasing opportunities for resident interaction. A glazed, 100-foot-long bridge on the second floor, above the entry, links the new and existing wings and displays the movement of students on the exterior, increasing the visibility of the activity within the residences. Although the IIT campus is only one transit stop away from downtown, the immediate neighborhood surrounding the campus has limited amenities. To address this, the ground floors of the new wings are planned to include a grocery store and a student-run coffee shop, as well as an academic resource center, a conference center, and the offices for the student residential life and the university housing departments. For IIT, as a technological university, it was a priority that the new wings employ a comprehensive sustainable design strategy. The new buildings are sited along an east-west axis, matching the solar orientation of the existing wings, so that the majority of windows face north and south, where sunlight is most easily controlled. The building skin is designed for high performance, including a Swiss Pearl cement fiberboard rain screen, a maximum of 30% of glazed façade, and a high value of thermal insulation. On the south façades, shading devices block direct sunlight in the summer while permitting sunlight to penetrate into the interiors during the winter. The shading devices also act as light shelves that reflect daylight deep into the building, reducing reliance on artificial lighting. Divided upper and lower blinds allow students to draw the lower blinds for privacy and glare control while still letting in sunlight for illumination. Giving students control over their environment is accomplished through a mixed-mode natural ventilation system, which combines the use of operable windows and a centralized heating and cooling system. Students will be able to modulate the temperature and amount of air entering their rooms by means of an air supply damper and operable windows. This combination provides a constant source of fresh air and reduces dependency on mechanical cooling when conditions permit. Vertical ventilation shafts embedded within the buildings serve as solar chimneys connected to rooftop greenhouses. During the late summer and early fall, when Chicago’s temperatures and humidity are high, students can close their windows and rely on mechanical air conditioning to bring temperatures and humidity down to a comfortable level relative to outdoor conditions. Although the two wings are identical in plan and section, they each incorporate different environmental technologies. DDA collaborated with Arup on the building systems. Energy-, water-, and waste-monitoring devices installed throughout produce data that will allow a student-run study to track the performance of one building against the other. The north wing is targeted to qualify for a Gold rating under the U.S. Green Building Council’s Leadership in Energy and Environmental Design (LEED) Green Building Rating System, while the south wing, which has additional technologies such as renewable energy and gray water recycling, is targeted for a Platinum rating. Technologies such as photovoltaics, wind turbines, and solar collectors for hot water heating are easily accessible, allowing them to be adapted, added to, or replaced as needed, making the buildings living laboratories. Students had a hand in developing one of the project’s most innovative sustainable strategies during a series of Interprofessional Projects, (IPROs), a course taken by all IIT undergraduates, in which students from multiple disciplines work together to solve a real-world problem. 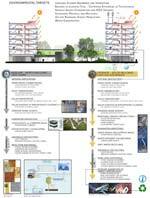 In 2007, participants developed concepts for an interface device offering residents information about the way they use energy, lighting, and water in relation to their neighbors. The expectation is that such a device will motivate students to learn new, conscious, sustainable behaviors. In the spring semester of 2009, in a second IPRO sponsored by ComEd, the Chicago area’s public energy utility, IIT students and Dirk Denison, FAIA, a professor in the university’s college of architecture, are studying available interface technologies and control devices. The goal is to design an interface that replaces the common thermostat by providing real-time information on energy use and the associated costs. Through the integration of student-centric spaces with performance-calibrated building design, the new student residences can serve as a model of excellence for past, present, and future students, and as a source of performance data that can be shared with university and architectural communities beyond the IIT campus. Construction is slated to begin in late 2010. Chicago-based Dirk Denison Architects has built a wide range of residential, institutional, and commercial projects throughout the United States, and has been recognized by peers and critics in awards and publications in the U.S., Europe, and Japan.